Here at People Tree, we’re excited that the conversations about ethical and sustainable fashion are getting louder, and the industry is listening. After the release of the True Cost movie last year, and the rise in the incredible campaign Fashion Revolution, more consumers than ever are actively making choices that counteract the fast fashion industry, and demanding change. There are many ways that the high street is responding: with recycling drives, organic cotton collections and slightly more transparent supply chains. While this is a move in the right direction, it is nowhere near enough and, in some cases, is nothing more than greenwashing. One of the ways you can guarantee that your clothes are as ethical and sustainable as possible is to ensure they are made according to the right standards in every aspect: Fair Trade is the gold standard in ethical fashion. Here are 10 of the ways that buying Fair Trade clothing makes concrete changes within the world of fashion.. The purpose of Fair Trade is to create opportunity for economically marginalised people in the developing world, alleviating poverty and promoting sustainable development. Fair Trade fashion means a transparent and accountable supply chain. Fair Trade means caring about the economic, social, environmental and cultural well-being of the people and communities who make our clothes. People Tree does not maximise our profit at the expense of the people who make our clothes. We build long term relationships based on trust and partnership. Fair Trade fashion means a fair price that not only covers the cost of production, but enables production that is socially and environmentally responsible. It means paying workers – both women and men – a fair wage for their highly skilled work. It also means Fair Finance, making advance payments to producers when necessary. While we all hope no child labour is involved in the making of the products we buy, the reality is that many conventional brands cannot guarantee there is no child labour in their supply chains. People Tree does not use child labour – and through Fair Trade premiums we support schools in many of our artisan’s communities. People Tree and other Fair Trade Organisations respect the UN Convention on the Rights of the Child. 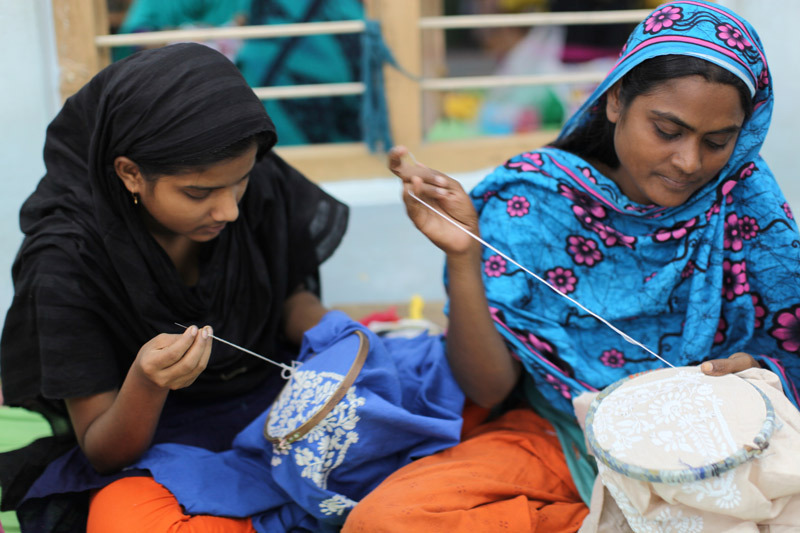 In Fair Trade fashion, women’s work is valued and rewarded – and women are paid fairly. Fair Trade empowers women, paying them equally to men for doing the same job. We provide women training to improve their earnings and provide work opportunities near to their homes, so that they don’t have to live far away from their children just to feed them. Fair Trade means a safe and healthy work conditions for producers. As a Fair Trade fashion brand, People Tree aims to empower our producers and strengthen their economic independence. We provide ongoing training and technical assistance to our Fair Trade groups, improving their skilled management capacity and opening access to new markets. Raising awareness and the possibility of greater trade and social justice in the world is at the heart of what we do. We provide our customers with information about how our products are made. Fair Trade actively encourages and pioneers better environmental practices and the application of responsible methods of production. We partner with our producers to develop innovative approaches to protecting the environment in their communities. We were the first fashion brand to launch the Soil Association Fairtrade-certified Organic Cotton mark on a product made in the developing world. As a student of consumer science, i ‘m really moved the philosophy of company. I know, for clothes, cunsumers tend to buy expensive and luxurious one or cheap and practical one. It’s normal and i think its same in my country, south korea and my place, Germany as well. World is huge and we need to respect the voice of minority. So far, we just developed for ourselves for making wealth. From now on, we need to change. We need to hear the voice from the lower place and small people. Happy that i can find a great company who wants to make the society world better. I came across this post when researching fair trade fashion and I am completely inspired! I graduated last summer with a degree in International Fashion Marketing, but I soon realised the reality of the industry and didn’t want to be a part of it. My love for fashion and all things creative is something I still wanted to do, so instead of leaving my dreams to work in the industry I decided I could use it to make a difference in the world. I volunteered in Malawi before I started university in 2010 and have returned and continue my work there through a small independent charity that houses orphans and create sustainable projects to benefit communities in the long run. I am very close friends with the founder of this organisation and decided to set up a fair trade clothing company with another volunteer I met in Malawi with a background in fashion, to provide employment for both men and women and to alleviate poverty in addition to inspiring the people in the communities that something can change. We have only just begun our journey, and I would really love if you could tell me any websites or books to help me find out some information on fair trade to help us.